Pinterest is an online pinboard that allows you to collect and display the images you find on the web. You can find boards from other people to discover new things and get inspiration. You can find ideas to plan a vacation, decorate your home or share your favorite fashion items. Pinterest is really visual. If you find something that pleases the eye, then you would like to pin it on Pinterest. This means that the most active categories on the site tend to be interior design, travel destinations, hobbies, fashion, food, etc. When you open up the home page of the site, you will see images of resorts, shoes, pies, furniture, and so forth. But not only. When you take a look at the categories list, you can see that there are in total 34 different categories. Let’s take a look at 14 Pinterest marketing tactics. 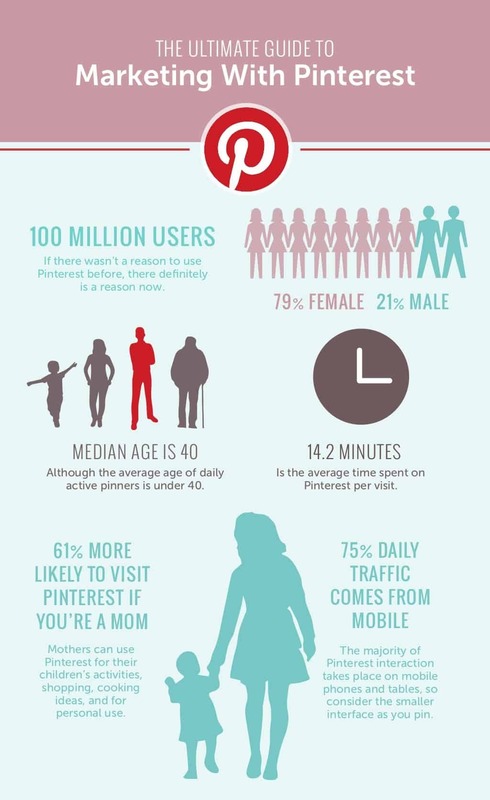 Pinterest has over 100 million active users, making it one of the most popular social media platforms. It has both female and male members, and the age ranges from teenagers to elders. In Pinterest, you can find people with various interests and hobbies. 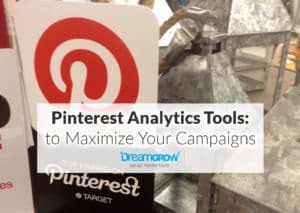 No matter whether your company is selling fishing tackles, language courses or even web analytics services, it is very likely that your audience is on Pinterest. However, to reach a bigger audience, you need to define who are your customers and what do they like? How do they spend their free time? What are their needs and desires? Having a clearly defined target group helps you to be aware of your customer’s preferences when tailoring the posts. Therefore, attracting more people to like your pins. Eventhough, people love to pin “chicken” and “chocolate” the most, there are people with wide range of interests. Most likely, your company can have a place on Pinterest too, just try to find a right angle to market it. In Pinterest, you can make various types of boards. Organize your boards according to the customers’ interests. In case you are selling furniture, categorize your boards according to your products. For example, if you sell beautiful vintage sofas, make a board named “Vintage Sofas.” If you also sell dinner tables, make a board called “Family Dinner Tables.” In case you also have Swedish-styled kitchen furniture, make a board “Swedish Kitchen Decor,” and so on. This will help your customers to find the boards that really interests them and not see the pins they don’t care about. Furthermore, make sure your board names are clear and description is catchy and to the point. 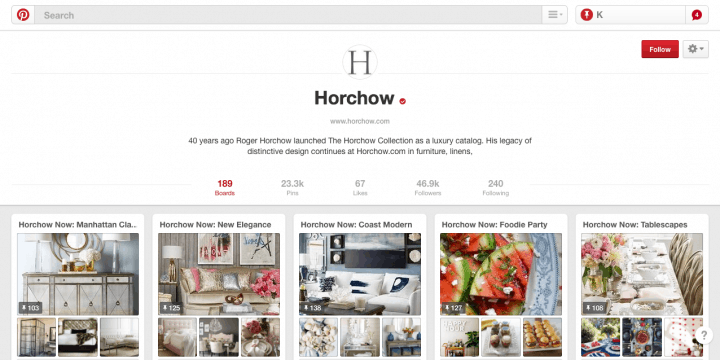 Horchow has managed to make a beautiful Pinterest board, categorising all of their products into certain themes. When creating content think really hard about the images you use. Are they pinnable? It is important to create visually attractive pins. Use high-quality pictures. Make sure your content is inspirational or informative. Use as little text as possible, make sure you use a nice font and colour. Keep in mind to use 735×1102 px for the image size. Promote a lifestyle that your brand enables. 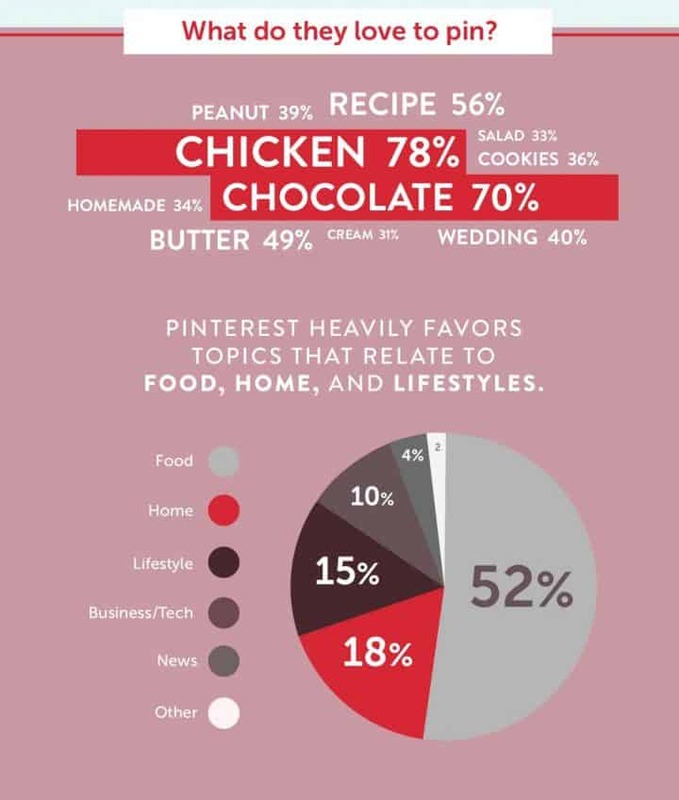 The most popular boards on Pinterest are lifestyle-related. Especially boards about fashion, food and home decor have the most followers. Give people ideas and inspire them. This will lead to sharing your content with friends and family. Don’t pin just your own content. Create relationships by repinning images from other users and give value to your followers by helping them discover new things. Urban Outfitters repins images regularly from other boards. (See the example above.) They have repinned Bohemian style inspiration that they have found on Pinterest and posted it on their board for inspiration. Try to use around 3oo characters in your description or less. To be more visible on Pinterest and get more repins, you need to choose the right keywords and hashtags in your pin descriptions. Using the keywords and hashtags increases the chances for your pin to appear in the search results when someone is looking for this specific search term. 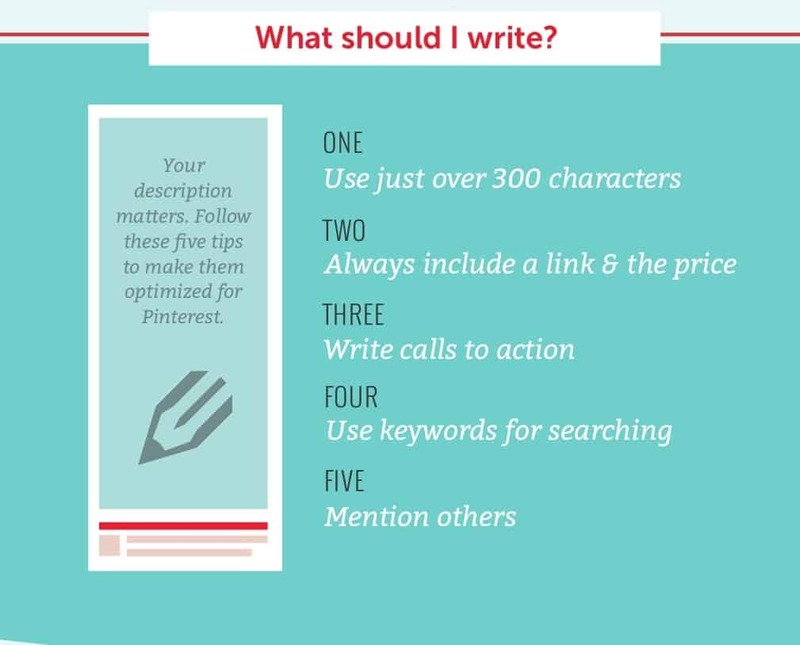 If you don’t know what kind of keywords to use, you can look for guidance in the Guided Search. (Guided Search on Pinterest appears just below the search bar.) This way you can find out what kind of keywords to type, to attract more audience. Share great content from others. If you find a great content that you can’t repost to your site then use Pinterest to get it to your audience. For example, we pin interesting social media & content marketing news and infographics in our pinboard. It’s always a good idea to run a contest where you let people pin your product images or take pictures of themselves using your brand. Or you can create a pin-it-to-win-it contest, where people just have to re-pin your post. This way you can build stronger user-engagement and gain more follower, or perhaps even new customers. If you don’t already have a blog, then make one. Having a blog is a great way to educate your customer and build trust. 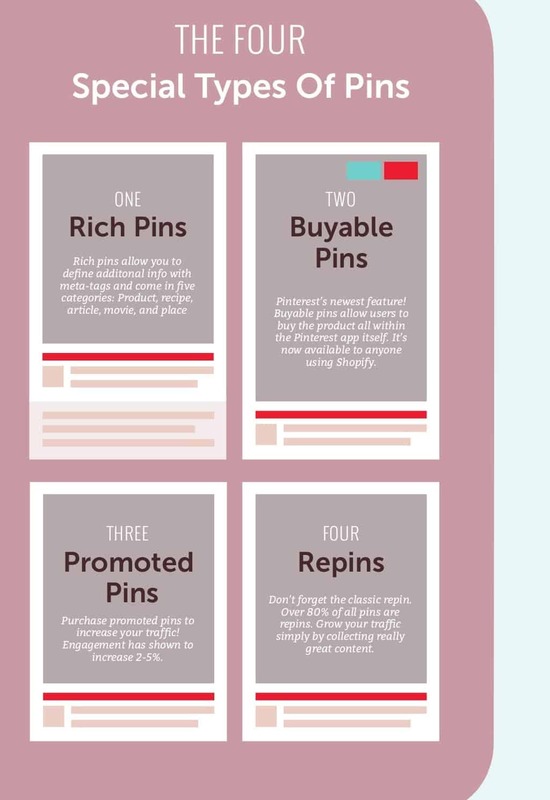 If you have your blog posts pinned on a Pinterest board, there is a high possibility that people, who click on the pin will also visit your blog to read more. Pin first, tweet later. If you find something visual that you would usually tweet about, such as an infographic, then pin it to Pinterest first and then tweet about the pin. Promoted pins help you to be seen by more people. 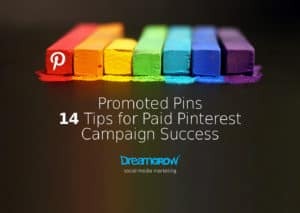 You can use promoted pins to raise your brand awareness, to engage more people or drive more traffic to your website. Keep in mind: promoted pins are only available for USA and UK based business. Pinterest promoted pins offers a simple advertising module. Just dive in and get your promotions going. To start off, you will select a pin that you want to use to promote your brand. Next, you will set your goals and then you will choose your audience (potential pinners). Then you will set a CPC bid for your campaign and budget. 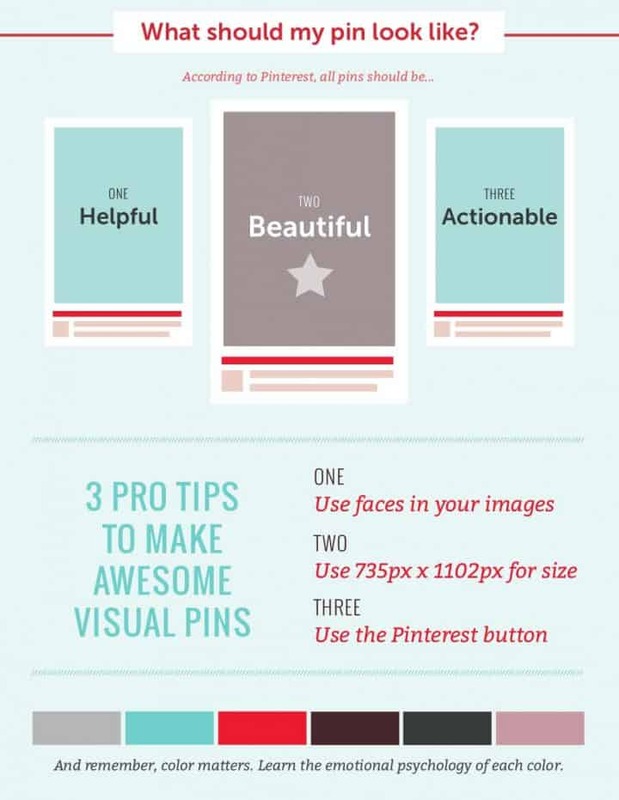 Read Pinterest Promoted Pins: 14 Tips How to Get Awesome Results. The more high-quality visual content you have on your website, the higher are the changes that people will pin your posts. So if you have anything visual to share use it! Add a “Follow me on Pinterest” button to your web site. For example, Create A Shoppe has put a follow button on their website. 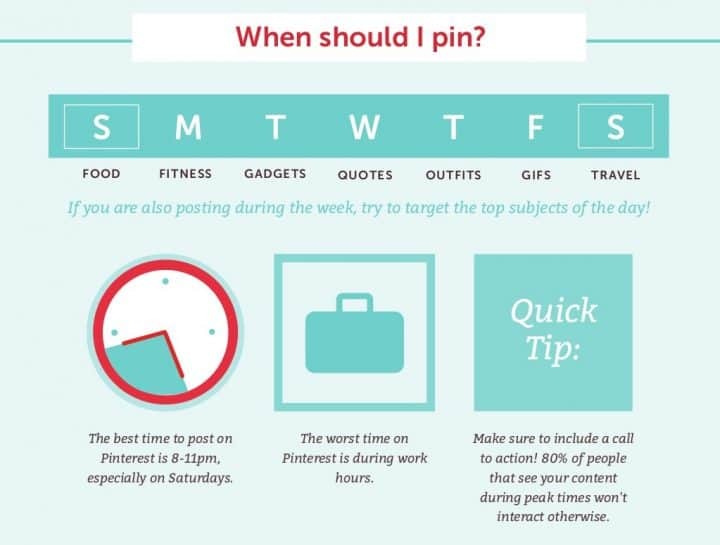 It has been identified that the best time to post on Pinterest is on Saturdays at 8-11pm, and the preferred topic is traveling. Fitness posts are popular on Mondays, and quotes are most popular on Wednesdays. Now go for a test drive with Pinterest. Let us know in the comments what ideas do you have about using Pinterest marketing for your brand. Very useful I will defiantly going to apply and use pinterest. Pinterest users are primarily drawn to the network for four obvious reasons: 1. It’s a place to make a statement about what inspires, motivates and guides the user. 2. It’s a good list reference tool for cataloging photos, products, quotations and resources useful to the user. 3. Eye appeal. Who can resist eye candy. 4. It’s an alternative environment that make products lists more acceptable in a social networks that was once a mix of personal dialog and photos. In addition to the above I find the Pinterest environment conducive to quickly drawing like-minded users together not unlike those who frequent craft fairs, conventions and product showcases. I find the like, share and comment excercise a powerful medium for making meaningful connections. For example, In our latest wedding planning book we feature an activity for the bride and groom that’s called “A Few of Our Favorite Things”. The activity involves listing only the interests the couple share in common. As time goes by that list gets longer as they bond closer having enjoyed sharing their mutual interests together. That said, Pinterest is the ideal venue for finding common interests among millions of users. As an event planning resource for reunions weddings and graduations it helps me showcase our latest printable invitations, flyers and event planning books. But I prefer to showcase without the price tag for very specific reasons. Users often find themselves focused on the image , it’s source and the profile of the one who pinned it. It’s important to pin a product in such a way that users are prompted to like it, comment on it and share and pin it. Putting a price tag on it says. “I Want You To Buy This”, a real turn off for anyone whose surfing for eye candy. All things considered, it’s probably most effective to have a product pinned by popular social personality or celebrity who has something intriguing to say about his/herself in connection to the showcased product. DIY crafts and books are becoming popular on Pinterest. This indicates that users are doing more than searching for eye candy. That said, a products best source link is a “How To” article or blog. I like to add DIY event planning books on my pin boards. I’ve learned that readers do well to link to the book’s review pages and and authors of books should consider pinning from their authors profile. Thank you very much, Mar, for your insightful comment. I really share your idea about not putting the price on pin as this seems overly promotional. The very first image I posted to Pinterest got a lot of traffic for me– got me hooked on it. We have started doing product and company highlights and posting them on pinterest. Two days in a nd it is driving traffic. If you read Pinterests ‘rules’ : you are not meant to put your own work/products on there or ‘market’ yourself. It’s all too lovely. Are you? 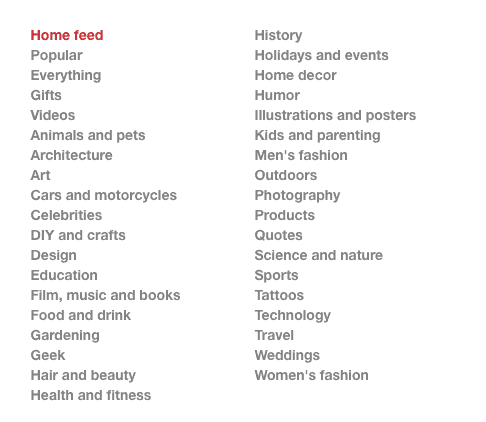 Quote from Pinterest’s etiquette guideline: “Pinterest is designed to curate and share things you love. If there is a photo or project you’re proud of, pin away! However, try not to use Pinterest purely as a tool for self-promotion.” I’d interpret that as you should not ONLY post promotional material but it doesn’t say anywhere that posting promotional material is not allowed. You shouldn’t spam Pinterest with too much content but that goes with any marketing channel really. If you stick to posting promotional material that is valuable for others, by all means, do it 🙂 That’s my 2c. Just joined pinterest and seemed to take forever to get the official invite. I think it is an excellent resource on a variety of levels and key topics. Recently had to totally delete my facebook and business fan page and start all over with better focus and content. Pinterest is a major part of that focus and content. What are your thoughts regarding Pinterest for B2B? We are doing it. No real business results yet (only 2 weeks into it) but Pinterest sends a lot of traffic. According to a Shareaholic study, Pinterest is now driving more referral traffic to other sites than Google+, YouTube, and Linkedin combined. It’s working for many brands, products, and services already. It’s also great to see specific marketing tactics in your article as they really do need to be different than those used on other social networks in order to take advantage of the unique demographics, visual power, and aspirational lifestyles on Pinterest. I’ve got some specific pin selection and copy tips on PinBliss.com at http://pinbliss.com/pin-selection-and-content/. Thanks for adding your experience with Pinterest. Your presence looks great on Pinterst. Any stats on sales? Thanks Priit. It’s actually quite an enjoyable experience creating the boards unlike most online accounts! Probably too early to tell for sales but I will write an article about Pinterest in a month or two about the results on our blog at www.muchbetteradventures.com/news so keep an eye out for that. Cheers! Thanks Sam. In your field Pinterest seems like a natural thing to use. Let us know how it goes. I think the grouping and easy sharing make the social network a great resource. Thanks for a fantastic article. Thanks Ryan. My experience with Pinterest is about as long as yours and it seems really great. Next story How to Use Your Customers to Get More Earned Media?